The legendary comedian Rodney Dangerfield coined the phrase “can’t get no respect‘ and after careful consideration, I believe he was referring to rib pain. Well, probably not, but it is amazing how little attention/ appreciation rib pain receives in the massage therapy community. Clients typically blame ‘between-the-blade‘ pain on tight muscles, and session after session the therapist beats on the rhomboids and lower traps only to amplify the problem. In many cases, a simple functional evaluation leads to the true culprit….fixated ribs and intervertebral joints. Not to say muscles don’t play an important role in creating/perpetuating rib misalignment, but the muscle itself is usually not the primary pain generator. Highly innervated joint capsules, spinal ligaments and nerve dura often prove to be the main events (key lesions) responsible for long-term pain and disability. Hypertonic knots palpated in the lamina groove indicate joint dysfunction and an exquisitely tender iliocostalis muscle at the lateral rib angle tells us the rib is fixated in either internal or external rotation (Fig. 1). I’ve found external rib torsions to be more common and symptomatic. Below is an example of a sequence of events leading to development of this condition. 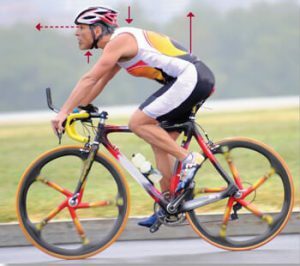 Luke, a marathon cyclist, acquired a bad habit of hyperextending his head on neck and neck on shoulders during training and racing events (Fig. 2). He presented with dull and sometimes stabbing shoulder blade pain particularly after a long ride. Luke confided he’d become a ‘therapy-junkie’ over the past three years and sported bruises along his scapular border to prove it. Seated examination revealed tissue texture abnormality (palpable knots) in the lamina groove at the T3-4 level on his right side. Although neck hyperextension failed to reproduce his symptoms, chin-tucking did flare sharp scapular pain and also caused bony knots to rotate back against my fingers (Fig. 3). It was apparent the T3 vertebra was unable to glide forward on T4 during neck flexion causing the transverse process of T3 to rotate to the side of the motion restricted joint (Fig.4). Adhesive facets are usually an easy fix in acute cases but long term cartilage jamming may lead to tissue degradation, protective muscle splinting and osteoligamentous canal pain. Rather than treat Luke seated. I opted for greater mechanical advantage and specificity by placing him in a Lateral Sims Position (sidelying with arm behind the back). With thumbs meeting in the lamina groove, a slow sustained pin and stretch technique was applied to the T3 transverse process as Luke resumed chin-tucking (Fig. 5). Soon the deep fibrotic rotatores, multifidi, intertransversarii and levator costalis began to melt allowing the T3-4 facets to disengage. When it was no longer possible to feel the T3 transverse process pushing against my thumbs, Luke was asked to repeat the neck flexion test. Although range of motion and pain during chin-tucking had greatly improved, he still felt a deep ache at the extreme end of neck flexion. In the presence of a dual fixation (rib and vertebral blockage), the associated rib must be carefully evaluated and treated. It’s not uncommon for ribs to lose joint-play due to ongoing mechanical stress (microtrauma). To assess, simply follow the T3 rib out to the iliocostalis muscle attachment at the rib angle (medial scapular border) and palpate for extreme tenderness (Fig. 6). Since Luke had a positive ‘jump-reflex’ at the iliocostalis, we were able to confirm the presence of an externally torsioned T3 rib. Fortunately, treatment for the rib torsion is almost identical to the pin-and-stretch technique above except the thumb pressure is now applied to the superior border of the rib shaft. As Luke began the chin-tucking motion, I asked him to slightly left rotate his head to increase stretch on the rib. This enhanced the ability of my thumbs to internally rotate the rib shaft back into sequence with the rest of the costal cage. 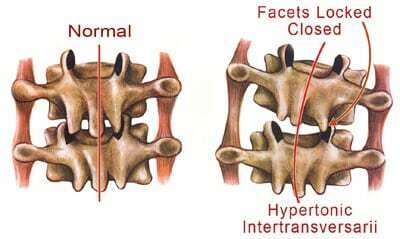 However, the rib torsion was a little more stubborn than the vertebral fixation and when it did completely release, I could hear some crepitus in the costovertebral and transverse joints. To maintain mobility, he was given home-retraining exercises and advice on repositioning his bicycle seat to decrease head hyperextension. This Myoskeletal Alignment Technique® uses bones as levers to release myospasm in the deep transversospinalis and erector spinae groups. Once vertebral and rib fixations have been properly assessed and corrected, normal tone is usually restored to neighboring paravertebral tissues and once these articular structures recover normal movement within the kinetic chain, deep tissue work in the area is painless and enjoyable. However, if this articular stretching routine fails to free the dual-fixation (due to chronically degraded cartilages), refer the client to high-velocity thrust. Another commonly mis-assessed ‘ between-the-blade’ pain generator is termed a dorsal dish. Inaccurate understanding of the biomechanics of this dysfunction frequently causes therapists to escalate the pain and sometimes injure the client. 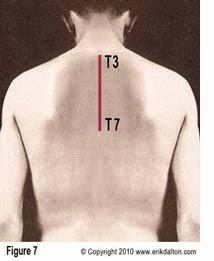 Visual observation and thoracic spine palpation reveal a flat spot (approximately T3 to T7) where there should be a convex curve (Fig. 7). If you have access to a plastic spine, contour it until you’ve established normal lumbar, thoracic, and cervical curves. Then place the spine prone on a table and notice how the T-spine’s gentle convex curve continues through the shoulder blades. Now, with a couple fingers, press down on the T4 transverse processes and observe what happens. If your pressure is equal with both fingers, the facet joints will approximate each other causing the intervertebral joints to close bilaterally. Therapists unfamiliar with the Laws of Spinal Motion commonly dig on the bony knots lying deep to the thick layer of paravertebral tissue thinking they’re releasing trigger points or muscle adhesions. Unfortunately, placing downward pressure on already chronically locked joints really hyperexcites joint mechanoreceptors. Prolonged over-approximation of joint surfaces compacts and, in time, degrades the articular cartilage. Tissue damage may stimulate an inflammatory response which hyperexcites the sensitive chemoreceptors. When mechanoreceptors and chemoreceptors ‘gang-up’ and bombard the neuronal pool with continual noxious stimuli, pain delivering nociceptors fast track the information to the thalamus, gray matter and other cortical centers. The brain usually responds by locking down the area with protective myospasm. Session after session, the therapist digs on the fibrotic knots until the client finally terminates therapy and moves on in search of someone who can help break their pain-spasm-pain cycle. With the client standing away from the wall arms extended, ask for a deep inhalation effort and chin to chest flexion maneuvers. To help neurologically re-program thoracic extensibility, simply tap with a finger at the T4 spinous process as the client inhales and chin tucks. 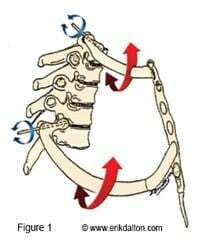 Engaging the respiratory diaphragm helps expand the costal cage front to back and side to side. This inhalation movement (respiratory enhancer) activates the scalenes which pull up the TOP two ribs, the pectoralis minor which helps lift ribs 3-5 and the serratus anterior and posterior which provides a little ‘bucket-handle’ movement through the costal cage. Pain manifests if a rib loses the ability to properly coordinate movement with the rest of the ribs and spine as part of a functional unit. This would be similar to a rowing team where one oarsman uses his ore out of sequence with the group. Altered rib function can cause difficulty breathing, restricted shoulder movement, referred pain to other areas, and reactive muscle guarding. Additionally, misaligned ribs can pinch intercostals nerves, sending excruciating pain through the length of the rib and, occasionally, the chest wall (the ole heart attack scare). Since rib dysfunction is frequently misassessed and, therefore, improperly treated, do your clients a favor and incorporate some spinal biomechanic principles and articular stretching routines into your toolbox of touch.